Few positions on the ice can compare to the goalie. Goaltenders are saddled with a task unlike any other and can be hailed as heroes and scapegoats depending on the outcome of each game. Coaching them can come with its own differences as well. But just because you never stepped between the pipes doesn’t mean you can’t develop strong goaltending. Kevin Reiter, goaltending coach at USA Hockey’s National Team Development Program, and Corey Schwab, goalie development coach for the San Jose Sharks, have some advice for youth hockey coaches. Kid-Sized Instruction: Kids look at goalies in the NHL and try to learn from them. They want to look like the next Ryan Miller or Jonathan Quick. What they sometimes don’t realize is what a grown adult goalie can do is very different from what a youth goalie can and should be doing. “My philosophy for these young goalies is that I want them to learn how to react and not just drop and hope they stop the puck,” said Schwab, a former NHL goaltender who also helps coach in Seattle’s Sno-King Hockey Association, one of USA Hockey’s Model Clubs. “These kids see NHL goalies who are 6-foot-2 and 6-foot-4 that are able to be in proper position, and because of their size, drop down for an easy save. Remind your players that even those NHL goalies learned the proper way to make a save before playing the way they do. Simply dropping down isn’t going to always make the save. Don’t Just Fire Pucks at Them: There’s no question goalies need to see a fair amount of rubber during practices. But that shouldn’t be the only focus, especially when they are just starting out. Peppering a young goalie with shots – especially hard shots from adult coaches – can lead to them being scared of the puck and ultimately losing the joy of the position. “Take shots that they can make the save and develop from,” said Schwab. Skating Strong: Contrary to popular belief, skating is crucial to a goaltender’s success. Strong skating ability allows a goaltender to read the play and at times come out of the net to make a move before the opposing player comes down low for the shot. Let Them Play as Forwards/Defensemen: While goalies are still young, let them play out as forwards or defensemen. There are a few goaltenders in the NHL that didn’t become goalies until they were 12 or 13 years old. Don’t Forget the Mental Side: The mental aspect of the game for goalies is huge. 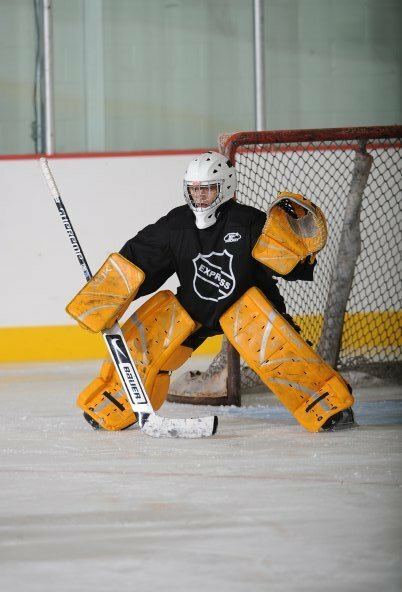 Help keep your netminder’s head in the game and help them grow as a goalie by building their confidence. USA Hockey offers a plethora of information and drills specific to goaltenders. Check out the material at www.USAHockeyGoaltending.com to learn more and better help your goaltenders make the next save.